Doug Steele shows you how to add drag-and-drop to your Access application using combinations of multi-value and single-value controls. The ability to drag and drop is easy to implement in Visual Basic, but the Access form model is different, so it’s not nearly as easy to implement it in Access. However, it’s possible to do, although you need to control it all manually. 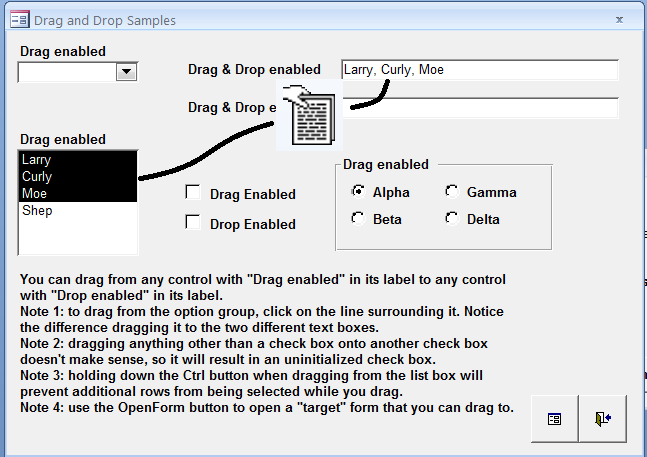 In Figure 1, I show you drag and drop of multiple items in a List box to a Text box. Just to be perfectly clear, I’m talking about dragging and dropping data, not the controls themselves. That means that some controls aren’t conducive to drag-and-drop. For example, you can’t drag a Command button or a Toggle button. As well, some controls are mutually incompatible for dragging and dropping. While you might be able to drag a check box, what would you expect to happen if you dropped it on a list box? On the other hand, if you dragged a check box to a text box, you might want the text box to display True or False, depending on the state of the check box when you dragged it. Rich-text boxes already support drag-and-drop, so I’m going to ignore them. Let’s consider what makes up a drag-and-drop event. First, you need to detect that the drag has started. Once you’ve got a drag operation underway, you need to be able to detect when (and where) the drag has stopped. If the drag stopped somewhere that can accept a drop, you need to detect that fact. Finally, if you’ve detected a drop, you need to handle the drop event. Microsoft has KB articles that demonstrate one way to implement these events–see http://support.microsoft.com/?id=287642 for Access 2002. In this column, I’m going to extend the implementation of that functionality. Dragging something requires that the mouse be depressed while dragging. This means that to be able to detect when a drag has started, you can use the MouseDown event for each control from which you want to be able to drag. Even if you’re not actually going to drag from the control when you activate the MouseDown event, there’s no problem with initializing whatever’s required, just in case. mfrmDragForm–The form from which the value is being dragged. mctlDragCtrl–The control on mfrmDragForm from which the value is being dragged. mbytCurrentMode–A flag indicating whether the current action is Dragging, Dropping, or nothing. You shouldn’t use Screen.ActiveForm in place of SourceForm because you may be dragging from a subform. It was a somewhat arbitrary decision on my part not to pass the active control as a parameter, based largely on the fact that passing the form meant less typing in each MouseDown event. If it makes you feel better, you can pass the control as well. If you’re using other controls that support multi-select, you’ll need to add additional cases in the TypeOf check. This code resets three variables: the mode (from DRAG_MODE to DROP_MODE), the drag quantity (from either SINGLE_VALUE or MULTI_VALUE to NO_MODE), and the mouse cursor. The code also sets a variable, msngDropTime, to the value of the built-in Timer function. This is important, since I use it in the next procedure to be called, DetectDrop. As you’ve probably guessed, this can be the most complicated part, especially when you allow dragging from controls that support multi-selected values. As I alluded to earlier, you may have to make decisions about what controls can drag to which other controls, as well as decisions about what to do if you drag multi-selected values onto controls that are only capable of showing a single value. In other words, copy the current value of the control referenced by DragCtrl to the control referenced by DropCtrl. In this code, I’m using the default properties for the controls, which is usually Value. I suppose that I could have been more explicit and used DropCtrl.Value = DragCtrl.Value. In this code, if DragCtrl is a list box with more than one row selected, I loop through all of the items in the ItemsSelected collection of that list box, concatenating each value to a string, and then assign the value of that string to the DropCtrl. If the bound column of the list box isn’t the value you want to display, you’ll have to change the line value DragCtrl.ItemData(varCurrItem) to something more appropriate, such as DragCtrl.Column(2, varCurrItem). Left$(strWhere, Len(strWhere) - 2) & ")"
In this code, I check from which of the two list boxes I’m dragging. If I’m dragging from lstListBox1 to lstListBox2, I know that I need to change the dragged records from not selected to selected. If I’m dragging from lstListBox2 to lstListBox1, I know I need to change them to not selected. The expression will be non-zero if the Shift key is depressed when the mouse is dragged. If it was depressed, I don’t bother with a WHERE clause in my SQL statement; I simply change all of the Selected values to either True or False. If the Shift key isn’t depressed, I loop through the list of all selected rows in the list box (using the list box’s ItemsSelected collection) and add each one to the WHERE clause. Once I’ve created my SQL string, I execute it. I use the Execute method of the DAO Database object to run a SQL statement rather than using the DoCmd.RunSQL because the Execute method doesn’t issue the “You’re about to update n records…” message box. Plus, the Execute method allows you to trap any errors that may occur running the SQL. Now that I’ve updated the table appropriately, I requery the two list box controls, so that their content reflects the updated table. Hopefully, you’ll be able to take these various building blocks and combine them into a module that will meet your specific needs. In this article, I’ve only addressed how to drag and drop from one control to another control in the same Access application. Coming up, I’ll take a look at what can be done to drag from non-Access applications to controls on Access applications.